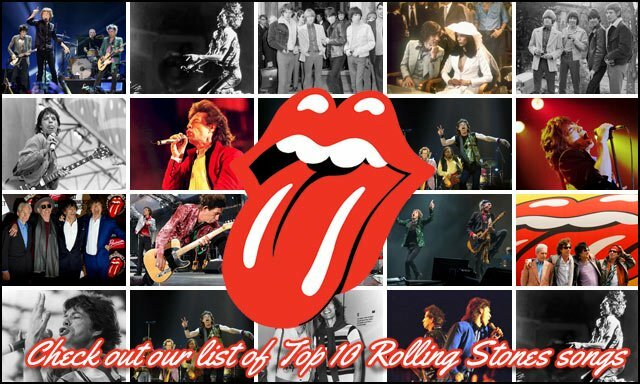 Scroll down below to find our top ten list of the best Rolling Songs. Each song listed is accompanied by their respective music video. “Wild Horses” is a song by the Rolling Stones from their 1971 album Sticky Fingers, written by Mick Jagger and Keith Richards. The song is credited, as most Rolling Stones songs are, to both Mick Jagger and Keith Richards, but it is acknowledged to be almost completely written by Richards. “Angie” was recorded in November and December 1972 and is an acoustic-guitar-driven ballad characterizing the end of a romance. The song’s distinctive piano accompaniment, written by Richards, was played on the album by Nicky Hopkins, a Rolling Stones recording-session regular. “Can’t You Hear Me Knocking” is a song by English rock band the Rolling Stones from their 1971 album Sticky Fingers. The song is over seven minutes long, and begins with a Keith Richards open-G tuned guitar intro. At two minutes and forty-three seconds, an instrumental break begins, with Rocky Dijon on congas; tenor saxophonist Bobby Keys performs an extended saxophone solo over the guitar work of Richards and Mick Taylor, punctuated by the organ work of Billy Preston. At 4:40 Taylor takes over from Keith and carries the song to its finish with a lengthy guitar solo. Though credited, like most of their compositions, to the singer/guitarist pair of Mick Jagger and Keith Richards, the song was primarily the work of Jagger, who wrote it sometime during the filming of Ned Kelly in 1969. “Jumpin’ Jack Flash” is a song by English rock band the Rolling Stones, released as a single in 1968. One of the group’s most popular and recognisable songs, it has featured in films and been covered by numerous performers, notably Thelma Houston, Aretha Franklin, Tina Turner, Peter Frampton, Johnny Winter and Leon Russell. To date, it is the band’s most-performed song. The band has played it over 1,100 times in concert. “You Can’t Always Get What You Want” is a song by the Rolling Stones on their 1969 album Let It Bleed. Written by Mick Jagger and Keith Richards, it was named as the 100th greatest song of all time by Rolling Stone magazine in its 2004 list of the “500 Greatest Songs of All Time”. “(I Can’t Get No) Satisfaction” is a song by the English rock band the Rolling Stones, released in 1965. It was written by Mick Jagger and Keith Richards and produced by Andrew Loog Oldham. Richards’ three-note guitar riff, ‌intended to be replaced by horns, ‌opens and drives the song. The lyrics refer to sexual frustration and commercialism. “Paint It Black” is a song by the English rock band The Rolling Stones. Jointly credited to the songwriting partnership of Mick Jagger and Keith Richards, it was first released as a single on 6 May 1966, and later included as the opening track to the US version of their 1966 album Aftermath. “Gimme Shelter” is the opening track to the 1969 album Let It Bleed by the Rolling Stones. Greil Marcus, writing in Rolling Stone magazine at the time of its release, praised the song, stating that the band has “never done anything better”. The song was written by the Rolling Stones’ lead vocalist Mick Jagger and guitarist Keith Richards. Richards began working on the song’s signature opening riff in London while Jagger was away filming Performance. As released, the song begins with Richards performing a guitar intro, soon joined by Jagger’s lead vocal. “Sympathy for the Devil” is a song by English rock band the Rolling Stones, written by Mick Jagger and Keith Richards, however, the song was largely a Jagger composition.. It is the opening track on their 1968 album Beggars Banquet. Rolling Stone magazine placed it at number 32 on its list of the “500 Greatest Songs of All Time”.